Fun in the Sun! Are you ready for the beach? Definitely use acrylic beaded fringe, not glass beads for this project. 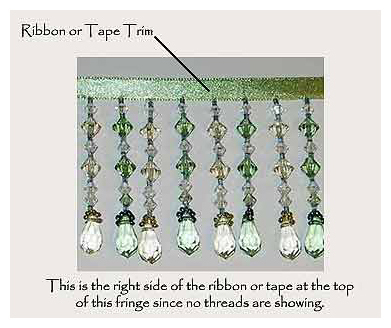 You will not want to use a very long beaded fringe for this project, or you won't be able to see! A fringe similar in length to our Drop Bead Beaded Fringe would work well. If you don't like the idea of short beaded fringe hanging from the brim of your hat, you can also attach it to the top of the brim, where the brim meets the hat band area of the hat. You may want to trim your beach towel in beaded fringe to match! Again, not glass beads - just acrylic. Simply, find a wide brimmed sun hat. We like this project done with straw hats - the wider the brim of the hat the better. Measure all the way around the brim of the hat or around the hat band. This is how much fringe you will need, plus 2". We have found it is difficult to pin the ribbon section of the beaded fringe to a straw hat, so take your time and just lay the beaded fringe ribbon top under the inside edge of the brim and securely stitch the ribbon in place - always checking to make sure that you are keeping the ribbon even all the way around the hat.